This page details the Miss New York Teen USA titleholders who have competed at Miss USA or competed in Miss USA state pageants. Click here for a full listing of Miss NY USA & Teen USA titleholders. Eight Miss New York Teen USA titleholders have competed or will compete at Miss USA, although only five won the Miss New York USA title. Two represented other states - Catherine Bliss (90) was Miss Vermont USA 1998 and Catherine Muldoon was Miss Virginia USA 2012 - and Ruth Zakarian (83), the inaugural Miss Teen USA, competed alongside Miss Teen USA 1984 Cherise Haugen at Miss USA 1984 without winning a state title. 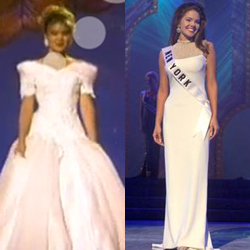 The most successful Teen to cross over to Miss was Kimberly Pressler (94), Miss USA 1999.